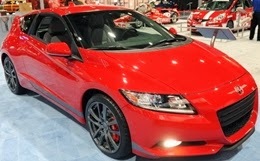 Honda launched its new Supercharged CR-Z HPD 2014 in Pakistan, Honda Performance Division has in fact developed a comprehensive kit of parts that can now transform a CR-Z into something more like an old CRX Si the 2014 Honda CR-Z Honda Performance Division Supercharged, the kit includes a supercharger that will make the Honda CR-Z’s 1.8-litre engine deliver 187 hp and 171 lb-ft f torque. While regular CR-Z is not that quick with crossing time of 0-60 in 9.5 seconds, the supercharger will reduce the the time by 2 seconds to 7.5 seconds. The supercharger kit will be BOLT ON with no major modifications.The clutch is upgraded to a limited-slip differential.Honda Performance Division have long wanted to build a car like the 2014 Honda CR-Z HPD Supercharged, but their obligation to things like practicality and reliability have held them back.The Super charger kit will be available for sale by mid of 2014.